Pumpkin Fest is Green Too! The Main Street Beautification Committee was formed in 1971. It was founded as (and still is) an all-volunteer group of civic-minded citizens from the Coastside who wanted to make a lasting contribution to the preservation and beautification of the town's historic Main Street. Directors have always served without compensation. Original Co-Chairs: Dolores Mullin and Edie Phillips. The original goal: launch a massive “paint-in” and tree-planting program to revitalize and beautify historic Main Street in downtown Half Moon Bay which, at the time, had decaying buildings and sidewalks; and, to provide a fund-raising opportunity for local non-profit organizations. To raise money for their cause, noting the abundance of pumpkin patches in and around Half Moon Bay, the committee decided to organize an old-fashioned, pumpkin-themed festival on Main Street hoping to attract visitors who had come to the coastside to pick Halloween pumpkins. For the first two years, the official festival name was “Spanishtown Art & Pumpkin Festival”. It was changed to Half Moon Bay Art & Pumpkin Festival in 1973. The first festival: an estimated 15,000 people attended (promising but small by today’s standards) and one local non-profit group opted to participate as a food vendor. Today: the festival draws huge crowds, is among the best-known events in the nation, and more than thirty local non-profits participate. 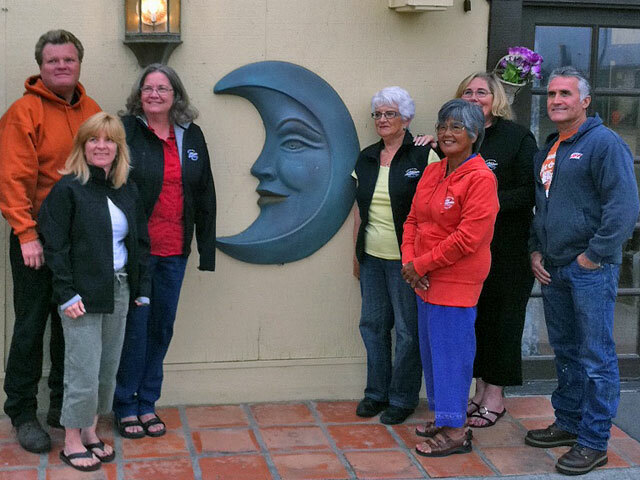 Changed its name to Half Moon Bay Beautification Committee and became incorporated in the State of California in 1985. Is organized under the Non-Profit Public Benefit Corporation Law for public and charitable purposes and is recognized as a 501(c)(3) of the Internal Revenue Code. Trademarked the name “Half Moon Bay Art & Pumpkin Festival” in 1985. In 2012, a subcommittee titled “Made on the Coast” was formed to highlight local artists. The festival's local artists' block occupies a section of Main Street between Mill Street and Kelly Avenue that hosts the yearly costume parade on Saturday, allowing our artists and musicians to make use of the block on Sunday from 9am to 5pm. In 2013, incorporated the Ol’ Fashioned 4th of July Parade as a sub-committee in order to sustain, organize and underwrite annual parade costs. Changed its bylaws in the mid-1980s to begin making grants (through an application process) to Coastside non-profit organizations serving children, youth, families, and seniors, as well as for Main Street and community projects, and also to fund annual scholarships for deserving high school students. Has contributed an estimated three million dollars in direct grants and donations since the festival’s inception in 1971. This figure does not include monies raised by non-profit groups that participate in the Pumpkin Festival. Every year donates over $10,000 in scholarship monies to Half Moon Bay High School students. Spends $25,000 annually on the maintenance and beautification of Main Street. Workers hired by the committee plant and maintain fresh flowers, re-furbish benches, and clean up and sweep Main Street every week. Has entirely funded a multitude of Main Street projects over the years at no cost to the city including: the renovation of City Hall, the painting of historic buildings, the installation of old-fashioned street lights and wooden benches, the underground wiring of Main Street, the original construction of Mac Dutra and Kitty Fernandez Parks, and the purchase of garbage receptacles and Christmas lights. Provides the year-round infrastructure, management and expertise organizing a world-class festival that serves as the foundation for an exceptional fund-raising opportunity to more than thirty local non-profit groups through sales of food, beverages, games, activities and parking. For most of the non-profits, the festival is their most lucrative revenue generator of the year, enabling them to fund a substantial portion of their annual budget. An estimated $500,000 is raised every year by non-profit groups. By providing this opportunity to the non-profit sector, the Pumpkin Festival helps to perpetuate “giving" in the community, no small feat for a community without a base of large corporate “donors”. Current Board of Directors: Cameron Palmer (President), Naomi Patridge (Vice-President), Melvin Mello Jr. (Treasurer), Kris Mason (Secretary), Bev Ashcraft, Heidi Kuiper, Kathy Llorente, Joe Borges and Donna Dexter. © Miramar Events. All rights reserved. Site developed and hosted by Rogue Web Works.